Where it is located: West Ridge is one of the 77 Community Areas of Chicago. It is directly west of Rogers Park and is often referred to as West Rogers Park. It is marked by number 4 on the Walks Location Map. How we got there: We drove and parked on Lunt Avenue across from the first stop on the walk, Indian Boundary Park at 2500 W. Lunt. You can also check for public transportation options at CTA Trip Planner. 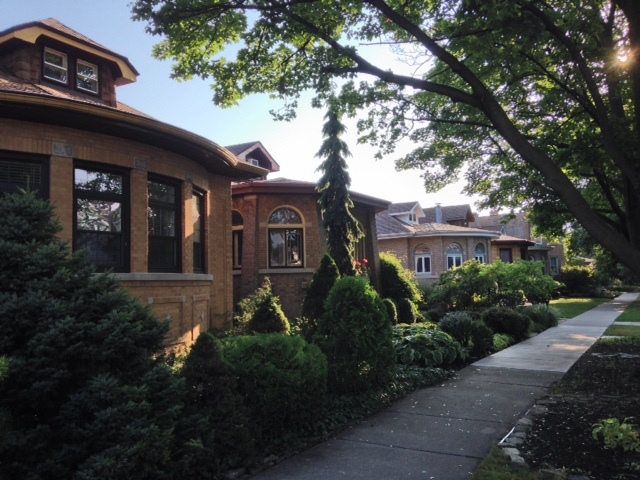 Marge’s Comments: I was lucky enough to come upon an architectural walking tour of the Rogers Park Manor Historic Bungalow District that I used in this walk. Bungalows are ubiquitous in Chicago, yet I never knew much about their evolution or role in the history of Chicago. There are still 80,000 bungalows in Chicago or 1/3 of its existing single family housing stock! The walk through the bungalows is fascinating and informative. You will be in for a bit of culture shock when you emerge from the quiet residential bungalow neighborhoods and onto the corridor of Devon Avenue known as Little India. Make sure to browse in the grocery store or grab a bite to eat to soak up the full experience. This walk has you going from the most quintessential Chicago neighborhood to its most foreign in under 5 minutes. Where else can you change countries that quickly? I call this the Indian cookie walk. It starts with the Indian Boundary Park and ends with the Indian restaurants on Devon. In between is a rich filling of some of the best beautiful bungalows Chicago has to offer. Safe, clean, interesting, and pleasant; it has it all. West Ridge was inhabited by Pottawatomie Indians in the 17th century. German and Scandinavian farmers settled and farmed here during the 1830s and 1840s. Chicago annexed the area in 1893. Development took off in the 1920s following the establishment of a street car line to this part of the city and in response to the unprecedented demand for housing at the end of WWI. 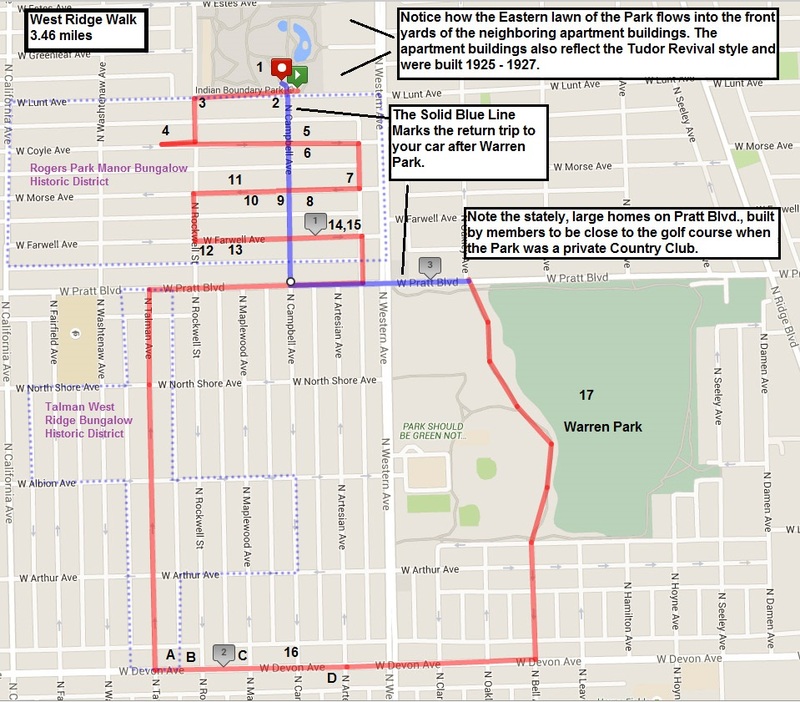 This walk takes you through two National Register Historic Districts: Rogers Park Manor and Talman West Ridge. The districts were so designated because of their collection of bungalows built between 1919 and 1930. The bungalow was designed as a practical, efficient and affordable form of housing that allowed many to participate in the American Dream of home ownership. The bungalow is part of Chicago’s history and its legacy is the more than 80,000 bungalows or 1/3 of the city’s single family housing stock that still stands today. Between 1920 and 1929 over 22 nationalities (predominately European) were represented in West Ridge. Today, Jewish, Indian, South Asian, Hispanic and Black comprise a little over half of the ethnic makeup of West Ridge. 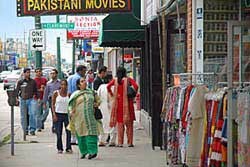 The corridor of Devon Avenue known as “Little India” is one of the largest and most well-known Indian communities in the United States, with many Indian restaurants, shops and markets. There is street parking on Lunt Ave., right in front of Indian Boundary Park. Indian Boundary is named after a territorial boundary established by the Treaty of 1816 between the Pottawatomie Indians and U.S. Government. The 1929 Tudor Revival fieldhouse features Native American themed ornament inspired by the park’s name. After a devastating fire in 2012, the building was restored and continues to exhibit Indian motifs throughout. In 2005, Indian Boundary Fieldhouse was designated a Historical Landmark by the City of Chicago and is also listed in the National Register of Historic Places. Items 2 – 15 on this walk were taken from the Walking Tour, Rogers Park Manor, by the Historic Chicago Bungalow Association. This 1926 bungalow mansion, or “Jumbo Bungalow,” by the architectural firm Dewey & Pavlovich is an example of the transition from the economically designed bungalows of the early 1920s to the more extravagant bungalows of the late 1920s. As more white-collar families took interest in Rogers Park Manor, housing prices rose, and the form of the Chicago bungalow transformed. Bungalows built in the neighborhood after 1925 often featured rounded or polygonal front bays, inconspicuous corner or side entrances, and more costly details like art glass windows, carved limestone, and ceramic tile roofs. The metal and stained glass marquee above the entrance is an unusual detail that can only be found on a few bungalows in Rogers Park Manor. In the 1930s and 1940s, Harry Spanjer, who won gold and silver medals in boxing at the 1904 Summer Olympics in St. Louis, lived in this house with his three sons and housekeeper. Known gangster Giuseppe ‘Joe’ Aiello, lived with his extended family in this two-story home until his murder in 1930. The Aiello clan was the principal rival of Al Capone for alcohol bootlegging in the north side of Chicago in 1927. Joe Aiello’s son, Tony, was among those sought in the murder of rival gangster ‘Big Tim’ Murphy, who also lived in the district at 2525 West Morse Avenue. The Stock Market Crash of 1929 brought an end to the 1920s building boom that had fostered the evolution of the Chicago bungalow. Just weeks before the crash, the last Chicago bungalow to be built in Rogers Park Manor was completed on September 24, 1929. Edward Reynolds’ bungalow, which he resided in, represents the climax of bungalow building in the district. The only true rounded bay in the district, uninterrupted by corners or piers, completed the trend from rectangular and one-dimensional to rounded and multi-dimensional. John J. Gubbins and Allan McDonald of the development firm Gubbins & McDonald lived across from each other in these two Mediterranean inspired bungalows they built in 1925. Gubbins, the business owner, lived at 2450 W. Coyle with his wife and young daughter, and McDonald, the builder, lived at 2453 W. Coyle also with his wife and young daughter. The duo, whose office was near the northeast corner of the district at Lunt and Western Avenues, contributed some of the first innovative bungalow designs to Rogers Park Manor. Gubbins’ home, with its second floor sleeping porch and hidden side entryway, shows architect Lyman Allison’s willingness to experiment with the standard form of the Chicago bungalow. On the other hand, McDonald’s home, which was built together with its nearly identical neighbor at 2449 W. Coyle, was a radical departure from the accepted form of the Chicago bungalow. Benedict Bruns was the most prolific bungalow architect in the Rogers Park Manor district, contributing a total of 47 homes. His earlier square-front bungalows were practical with modest ornamentation. In 1925, Bruns designed 16 bungalows, 13 of which were some of the earliest in the district to feature polygonal front bays. Bruns’ bungalows were also among the first in the district with more developed ornamentation, featuring various brick patterns, limestone detailing, and leaded art glass windows. In 1928, Bruns designed these three elaborate bungalows, which represent the completion of not only Bruns’ progression in the district, but also the progression of the bungalow building trend in Rogers Park Manor: breaking the mold of the early practical bungalows, but quickly fashioning another more elaborate mold to replace it. These three bungalows designed by Benedict Bruns are typical examples of the early form of the Chicago bungalow in the Rogers Park Manor district. Chicago bungalows built in the district before 1925 exhibit the same features with few exceptions: flat or slightly projecting front bays, groups of standard double hung windows, recessed corner or side entrances, and minimal geometric limestone detailing. These early bungalows in the district followed a simple, economical formula. 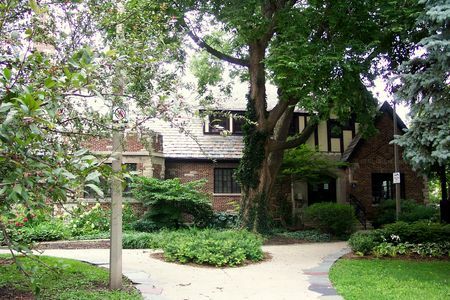 Like most Chicago bungalow architects, Bruns relied on horizontal emphasis to connect his bungalows to the surrounding landscape through the use of low-lying rooflines, expansive eaves, grouped windows, and brick and limestone detailing. These three bungalows, which cost $7,000 and $8,000, were pricier than the average cost for simple formulaic bungalows—between $5,000 and $6,500. In the fall of 1922, Swedish-immigrant contractor Arvid Nelson built for his family the first Chicago bungalow in the district. Features such as the arched entryway, broad overhanging eaves, painted red cement tile roof, and complementary mottled green and red face brick give character to the simply shaped bungalow. But it was the simple form that set the standards for the first wave of bungalow building in Rogers Park Manor. The first owner of this late Bruns bungalow was known gangster Timothy ‘Big Tim’ Murphy. On June 26, 1928, he was shot and killed in front of his bungalow by four gunmen. The funeral was a large-scale affair, with attendees filling the street in front of his house to watch as Big Tim’s casket was carried out. The six bungalows in this row by Gubbins & McDonald and W. C. Wright were some of the first innovative bungalow designs to be built in the district. Even a couple years earlier, the form of the bungalow at 2534 W. Morse can be seen elsewhere in the district—at the northeast corners of Farwell and Washtenaw, and Coyle and Rockwell—with double gables and a side porch and entryway. The six bungalows are modest examples of the Mediterranean Revival and Spanish Revival styles that were mostly popular among builders of much larger homes in the district. Edward Zeches significantly contributed to the architectural landscape of Rogers Park Manor, and even chose to settle in the neighborhood. Instead of upscale bungalow living, however, he chose an even more extravagant Mediterranean Revival home (the most expensive home built in the district). During the bungalow boom of the 1920s, the secondary building trend of Romantic Revival styles guided the construction of larger single family homes in Rogers Park Manor. The primarily Tudor Revival and Mediterranean Revival homes were often built on more spacious corner lots, accenting but not interrupting the smaller scale bungalow housing on interior lots. Many of these larger homes were built by the same architects and developers who were building Chicago bungalows; and the case is true here with bungalow architects Dewey & Pavlovich. Zeches’ home is not only a notable example of terra cotta tile roofs, but the house is entirely clad in terra cotta. This 1925 bungalow is an example of early enlarged front rooms in the district’s bungalows. Early projecting bays like this one were contained under the main roofline of the house and projected only slightly from the bungalow’s primary rectangular massing. The shape of these early projecting bays was square as opposed to the polygonal and rounded front bays that later grew in popularity. Also typical of this bungalow subtype, the deeply recessed side entrance accommodates the enlarged bay which takes over the entire front of the house. The influence of the Arts & Crafts on the form of the Chicago bungalow can really be seen at these two early homes by Lyman Allison, who was responsible for 26 bungalows in the district. The covered corner porches are a more direct approach to the Arts & Crafts ideal of bringing the outdoors in. Allison’s corner porches would later be appropriated by other prolific architects in Rogers Park Manor, particularly Benedict Bruns. More common methods of connecting bungalows to the surrounding landscape can also be seen in this pair: low-lying rooflines, broad overhanging eaves, generous grouped windows, built-in planter brackets below the windows, and an overall horizontal emphasis. 2434 W. Farwell’s battered stone post is an Arts & Crafts influenced feature unique among Chicago bungalows. Arvid Nelson, the first Chicago bungalow developer in the district, built this quintessential square-front Chicago bungalow with a recessed corner entrance. It stands in marked contrast to its neighbors at 2434 and 2436 W. Farwell even though the three bungalows went up at the same time. Bungalows in Rogers Park Manor were built one at a time or in small groups of no more than five by dozens of architects and builders, as opposed to more rigidly planned bungalow neighborhoods in which homes were built in large groups. Therefore, the great diversity among the district’s bungalow stock is not only due to the late-1920s transformation the form of the Chicago bungalow underwent, but also to this building pattern. Despite the variety, the district maintains a sense of uniformity due to the prominence of 1 ½ story brick bungalows with common features such as low-pitched roofs, broad overhanging eaves, offset entrances, grouped windows, and limestone detailing. Cross Pratt and walk down Talman Ave. to Devon Ave. This is the heart of the Talman West Ridge Bungalow Historic District. B.) 2610 W. Devon, Patel Bros Grocery: Are we still in Chicago? This park was once a private country club and was saved as open space from developers by a vocal group of residents and the help of then governor, Richard Ogilvie in 1969. With almost 90 acres of land, this Chicago Park is the largest in the North Region. Some of the stately old homes along Pratt Blvd. across from the Park were built by members when the property was still a private club so they could be close to the club and the golf course.